Good Grips Bendable Cutlery For Users With Weak Grip. The Good Grips® bendable cutlery range have large, cushioned handles with soft flexible ribbing at the top, ensuring they are comfortable to hold even when wet and adaptable to any grip. 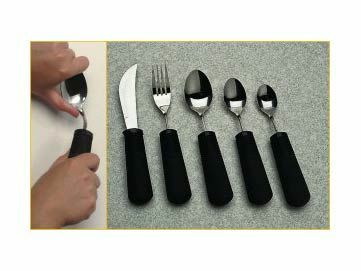 Of particular use to those who find eating difficult (arthritis sufferers, those with a weak or painful grip), the cutlery has a special twist in the shaft that allows each utensil to be bent to any angle to suit the user's individual needs. Please note: the cutlery should not be bent more than approximately 20 times. Dishwasher safe. Available as a full set (knife, fork, spoon, tea spoon, large desert spoon) or separately. Really great quality cutlery. I am finding these items very helpful.